The three Wise Men brought gold, frankincense, and myrrh to Jesus/Yeshua when he was a young child, still in Bethlehem. The Frankincense and Myrrh were common healing spices used in embalming, and in ancient medicine. They were known for their ability to heal wounds and to stop decay. And their healing virtues would have been known to the women of the bible, who were tasked with caring for the sick and preparing the bodies of the dead. 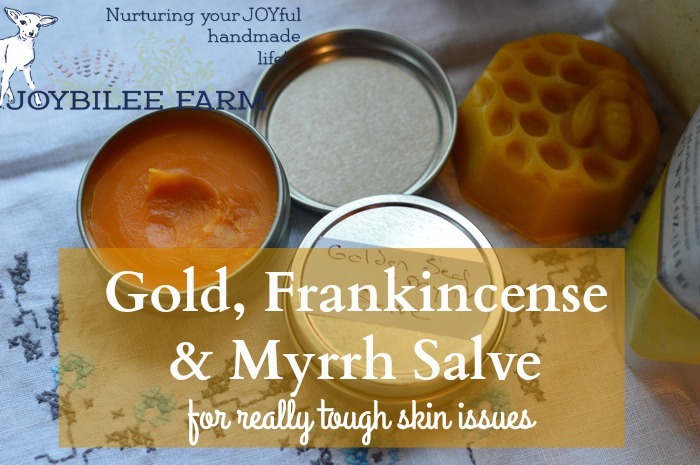 It is not outside the realm of possibility to think that Mary may have made a healing myrrh salve or frankincense salve to keep her young child healthy. Theologians have long postulated that the gifts of the wise men represented wealth for the holy family to sell and to finance their journey to Egypt, and that they had a prophetic significance. Frankincense was sprinkled on the daily grain offering in the Temple, while myrrh was a common spice in embalming, prefiguring the Messiah’s bloody, sacrificial death. I propose that perhaps they were used in a home apothecary by Mary, although scripture is unclear about what happened to the wise men’s gifts. Perhaps Mary infused a small portion of the myrrh and frankincense in Bethlehem olive oil and made a salve like this goldenseal, frankincense, and myrrh salve for her family’s home apothecary and “bug-out first aid kit”. You’ve probably seen it in the health food store. 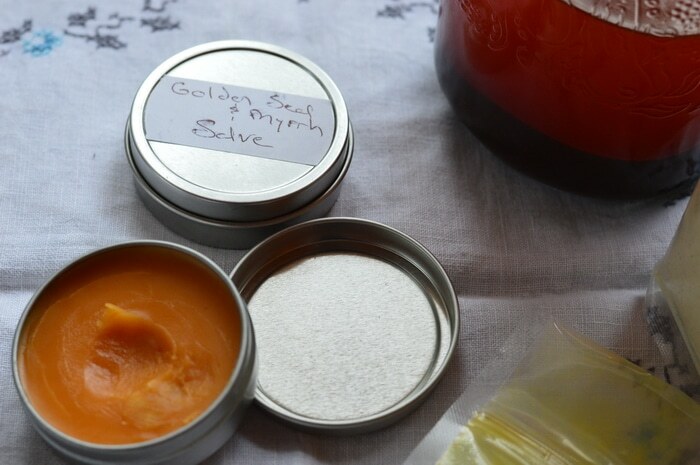 Tins or jars of goldenseal and myrrh salve are one of the mainstays of the herbal apothecary. And for good reason. Goldenseal Myrrh salve is the salve you need for stubborn skin issues that don’t seem to go away. Issues like psoriasis, eczema, infections, swelling, scars, rashes, and inflammation find relief in this folk remedy. If the doctor has only corticosteroids to offer you for your condition, which suppress your symptoms without healing the underlying issue, this salve may help. Frankincense and Myrrh are exotic resins, scraped from the dried exude of Middle Eastern trees. They are strongly aromatic and held in esteem in several cultures for millennium. Used as fragrant incense in worship, they are dear to purchase. Thankfully, you don’t need much. Both Frankincense and Myrrh are anti-inflammatory, anti-microbial, analgesic, anti-fungal, antiseptic, astringent, and tonic. As resins they are not soluble in water. When made into tinctures with alcohol, only the strongest alcohol — around 95% — will work. Anything lower will just be a mess in the jar. However, resins are soluable in oil and make wonderful salves, lotions, and creams. Get the finest grade of myrrh and frankincense powdered resin. Incense grade resins are generally sold in hard chunks and are not as easy to grind into a powder. Goldenseal is an endangered North American woodland herb. Since the root is used, it should never be wildcrafted. Organically grown roots are widely available. 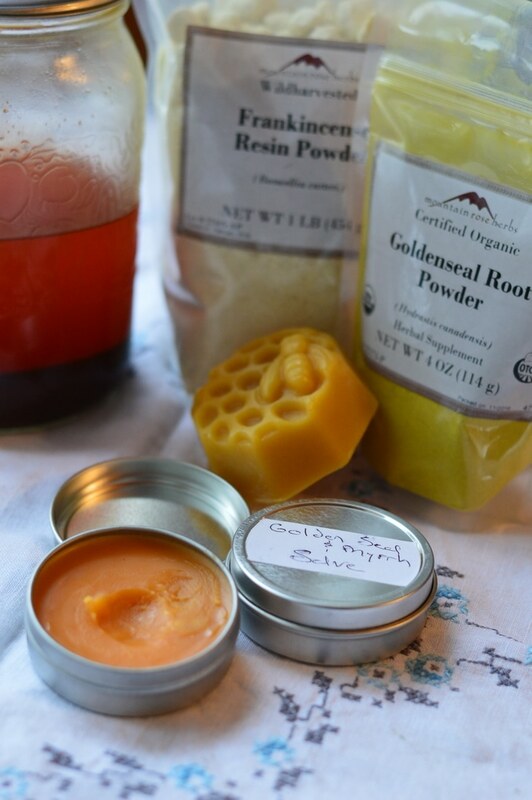 The root is bright yellow and contains berberine, a bitter alkaloid that is valuable for both skin issues and stomach complaints. Goldenseal is antifungal, antimicrobial, antiseptic, anti-bacterial, anti-inflammatory, astringent, as well as being a circulatory stimulant. Cayenne pepper is often added to herbal medicine as a catalyst to increase circulation and warmth, so that the other herbs work more efficiently. I’ve added it to this recipe for the synergy it offers. This recipe makes just 2 – 2 ounce jars, but you’ll have enough myrrh and frankincense infused oil for additional salve recipes. The resin infused oil has a long shelf life. Add myrrh, frankincense, goldenseal root, and cayenne pepper to the mason jar. Fill the mason jar with oil. Stir to fully moisten the powdered herbs. Add more oil to cover the herbs with oil. Place the jar in a slow cooker or instant pot. Fill the slow cooker insert with warm water so that it comes half way up the side of the jar. Turn the slow cooker on low heat. Heat the jar in the water for 24 hours. The oil in the jar will turn orange. During the heating time shake the jar a few times to distribute the powdered herbs in the oil. Allow the herbs to settle in the oil before straining. The herbs can be left in the oil for up to a week at room temperature. Strain the herbs through a coffee filter to remove the powdered herbs. Press the filtered herbs to retain as much of the oil as possible. Retain the oil in a clean, dry jar. Much of the resin will remain dissolved in the oil. Label and date the infused oil. The infused oil will remain effective for up to 5 years if kept in a cool, dark place. Resinous oils have a long shelf life. Save the pressed resin for making incense. This infused oil is the basis for the Goldenseal-Myrrh Skin Salve Recipe below. Create a double boiler using a one cup glass measuring cup. Add the herb infused oil, shea butter, and beeswax to the cup. Simmer the water in the double boiler over low heat until the beeswax and shea butter is fully melted. Remove the pan from the heat, and the glass measuring cup from the pan. The essential oils in this recipe add to the soothing, anti-inflammatory effects. However, the salve is just as effective without the addition of the essential oils. If you wish to use them, you would add them now. Stir the salve with a thin spatula, as it begins to cool. As it starts to thicken, pour it into two 2 ounce tins. Leave the cap off the tin until the salve has cooled completely. Then cap the salve tins and label. Use on scratches, bites, and tough skin issues. Use it externally on swollen lymph nodes and swollen glands. A scant dab is all that’s necessary. Apply as often as you need to. How much herb should I buy? You’ll be able to make this recipe with ¼ pound each of goldenseal, frankincense, myrrh, and cayenne pepper. You’ll have ample goldenseal and cayenne pepper for other herbal remedies, too. Because of the dearness of frankincense and myrrh I will pour more olive oil or coconut oil over the pressed resin to get one more infusion before I use the resin in incense. As long as the infused oil is fragrant, it contains active herbal actions. If goldenseal isn’t available, other berberine containing roots can be used in its place, although for this application goldenseal is the best choice. 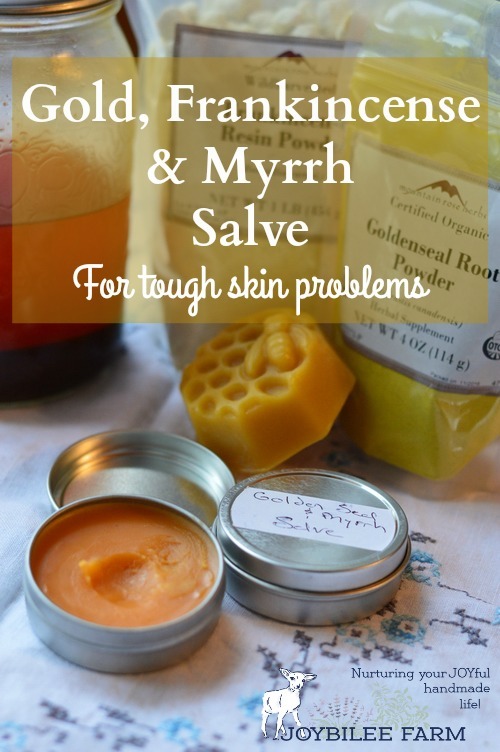 While goldenseal adds strong antimicrobial actions to this salve, Mary, of course wouldn’t have had access to it. However, other berberine plants grow in the holy land, such as barberry. The root of barberry contains the same berberine alkaloid as goldenseal. 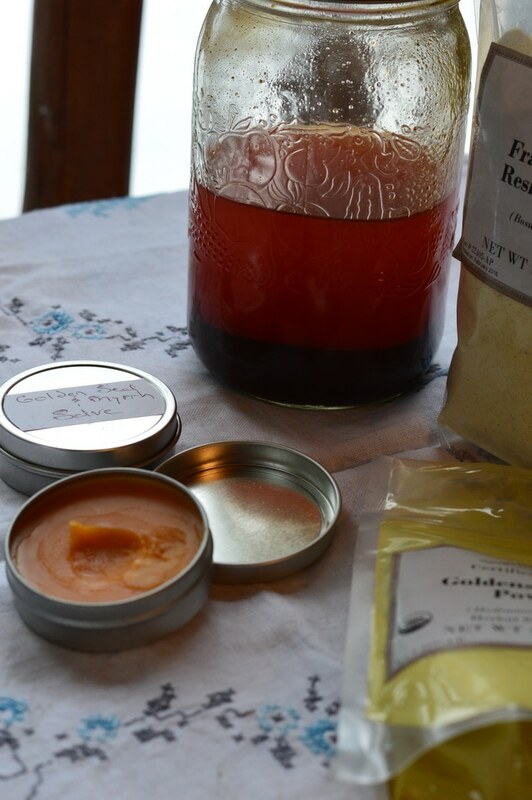 If you feel that the herbs in this salve are too dear for your budget, (I’ll admit, they are some of my more expensive herbs) get together with a dozen friends and do it as a group project. There are enough herbs on the shopping list to make 3 cups of infused oil. That is enough to make 12 to 14 batches of this recipe or 28 tins of salve. 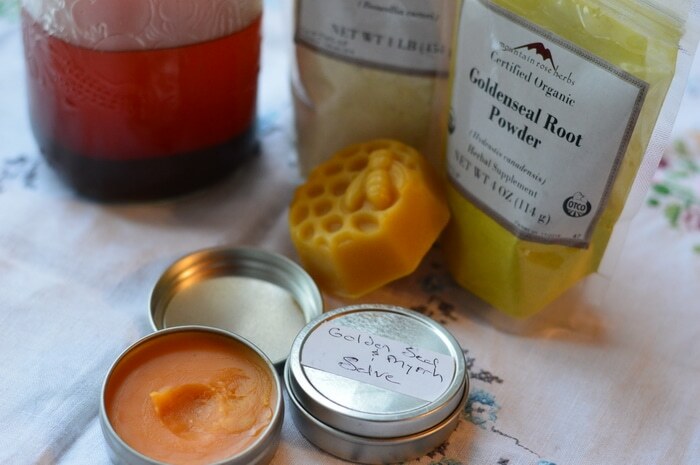 You’ll need 1/2 ounce of beeswax and 1/2 ounce of shea butter or cocoa butter for each recipe, too. As you are infusing this fragrant oil and making a quality skin-healing goldenseal, frankincense, and myrrh salve, consider the wise men’s gifts and be wise in your herbal knowledge. Herbal knowledge is a gift. 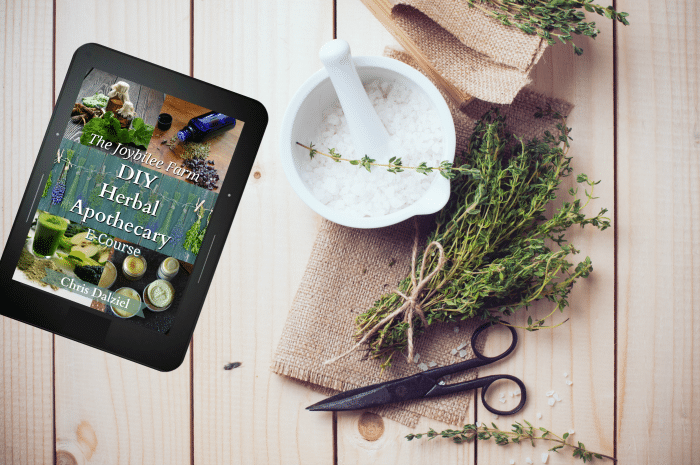 Let this year be the year that you finally keep that promise to yourself and learn about growing and/or using herbs for your health and wellness needs. It starts with a salve, a tincture, or a cup of herbal tea. It begins with a sip, a slather, or a swig. And your knowledge grows with experience. You don’t have to accept the pricey steriod prescription or the other meds that just mask the symptoms, while at the same time putting your health at risk, maybe damaging your liver or kidneys. You can take control of your health with knowledge and determination. It begins by taking the first step. If you are going to do it this year. Leave a comment and tell me. Even if you aren’t going to do it this year. Leave a comment and let me know what you think. Several medicinal herb suppliers carry them. Mountain Rose Herbs, Starwest botanicals. I’ve also seen the resins where incense is sold. Do you offer this Gold, Frankincense, Myrrh for sale in your store? I would like to make this recipe but only have the resins in tears. Would I have to find a way to powder them first or would the tears melt in the warm oil? I would just melt the tears in the warm oil. Then strain any unmelted ones out of the oil before you use it. You can reuse those. Would you use the same amount of resin tears as powdered? Or would you need to lessen the amount as they are larger chunks? You can powder the tears using a mortar and pestle. Thank you for all this information. I am new to making salves and tinctures.I will try this one very soon. Infusing herbs and using my own oils has been very rewarding. 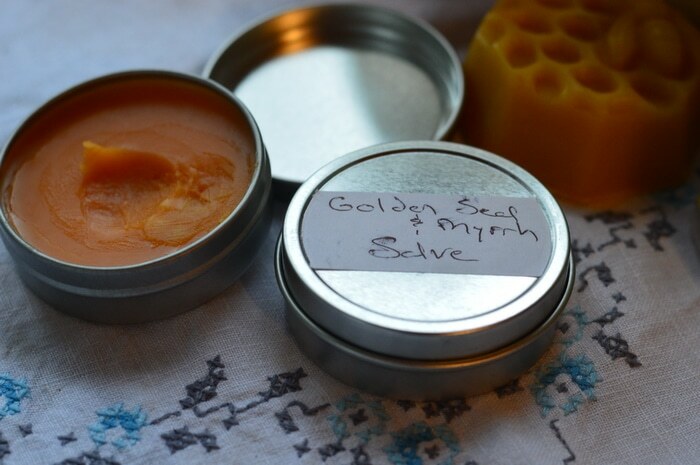 The salves I have given away have helped several people with their pain and skin problems. Getting back to nature and using what Mother Earth has provided us, only is so rewarding. I am looking forward to trying this new salve. This sounds awesome! Just want to make sure it’s OK on a two-year old. I have a grandson with eczema. Definitely use it for anything that is skin related. Scrapes, bites, bruises. Goldenseal is highly antimicrobial and antifungal, the other two are antimicrobial and antiinflammatory, too. I wondered if you would be able to use frankincense and myrrh essential oils in place of the resins? I have those on hand. Sure. You’d lose some of the healing qualities that are provided by the resin itself, but you’d still get the aromatic, antimicrobial, and anti-inflammatory effects. I love the varieties of remedies you provide! I have made and used many of them myself as well as some for friends. I am going to try this one for lichen planus skin issue for which the doctor prescribed a steroid cream. I will let you know if it works. Again, thanks for all your posts. I always look forward them. I am perimenopausal and noticed a rash that seems to get worse with stress. It looks almost like hives. It itches like crazy. I have gone to my doctor, dermatologist and they always prescribe a cream with steroids. It might work for a minute but then top working. I am desperate. I will try this. Thank you for your blog. What do you think about my husband ‘s skin problems: he has furunculosis ,many painful furuncules. They don’t go with nothing.They stop apearing sometimes,but after a while they come.again. My 6 month old baby girl, Harvest, is having a hard time with eczema. I was wondering if you would consider this salve safe to use on a baby? I’m sorry to hear that your baby is struggling with eczema. 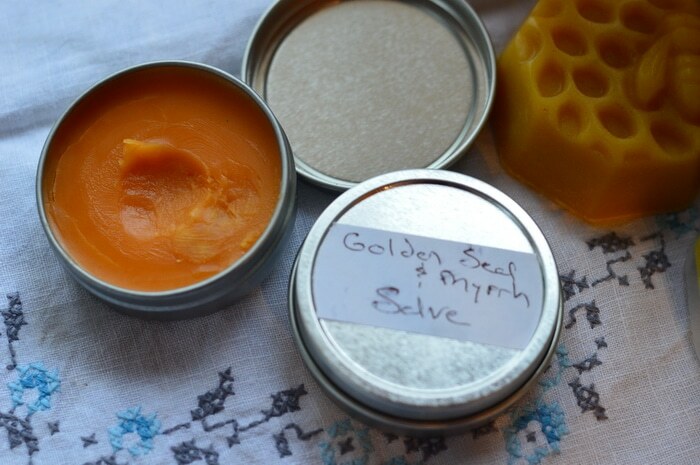 I have a gentler salve recipe that I prefer for children. It has fewer ingredients so less likely to create an allergy. The post for this is going up on my blog next week but you need this now! Here is the recipe: 2 tablespoons Marshmallow root, calendula, and lavender infused oil, plus 2 tablespoons shea butter. Lavender essential oil is safe to use with babies at a 1/2% dilution (6 drops per 2 ounces of other oils). This should be kept in the fridge. It will be solid like butter in the fridge but will melt on skin contact. The soothing and cooling actions of marshmallow root help with the itching and redness, too. Calendula speeds skin healing and reduces inflammation while it helps move waste through the lymph system. The lavender plant (and essential oil) is antimicrobial and antifungal so should help guard against minor infections. You can use this as often as needed. Eczema is a sign that the liver and kidneys aren’t working optimally. Is there something that is causing toxicity overload in your home? Has your baby been exposed to toxins? You might want to talk to an herbalist or alternative health practitioner specifically about your baby’s issues. Note that this is not a prescription and I am not a doctor. This is offered as information only as a grandmother sharing with another mom. Check back on my blog next week for the complete recipe. Chris, I’d love to have the link to this infusion for marshmallow root, calendula, & lavender oil! If you have time & don’t mind, please post the link! My youngest has bouts of eczema typically as a result of too much sun & pool time…we’ve managed to create several preventative measures but I’m always looking for new ways to create great things for my kids! Thanks! Thank you for sharing this. I find it especially interesting since my 16 yo son is battling severe acne and some swollen lymph nodes. We are trying all natural remedies after already trying meds for his acne, but he is discouraged. Would this salve be helpful for acne? I am truly concerned for him as it is affecting how he views himself and I’m getting desperate for a natural solution that works. (We are working at gut health with probiotics also). Thanks for any suggestions you might have. It sounds like your are on the right track. Have you thought of dropping all dairy from his diet. People I know found that helped quite a bit with break outs. Anna I bought mine at Mountain Rose Herbs. You can also find them through Amazon. Are you saying essential oils in the place of frankincense and myrrh? Yes you can certainly omit the step of infusing the oils with myrrh and frankincense resin and instead just infuse the oil with goldenseal powder. However, you will lose some of the therapeutic benefits of the frankincense and myrrh resin, which are slightly different than the essential oils. Limit your essential oil addition to 50 drops of essential oils. There is no substitute for the goldenseal powder though unless you use another berberine plant, like oregon grape root. Berberine doesn’t have an essential oil equivalent. Thanks for dropping in. Blessings. What a great post! 🙂 I love reading your blog and hanging out here “on the farm”… blessings!